It’s not often that you see a data recovery software that gives you full functionality in the free version. But that’s exactly what you get with EaseUS Data Recovery Wizard Free 12.8 for Windows. Not only does it give you full support for any type of data loss scenario, but it offers an easy and quick way for even newbie users to recover their lost data without possessing any technical expertise. What Can This Data Recovery Software Do? The free data recovery software from EaseUS is a powerful tool that can recover data quickly under the most demanding conditions. Whether your hard drive has been damaged or your computer has crashed after an OS installation or a virus attack, this tool can get your data back. It can also recover data from a wide range of hardware products like digital cameras, memory card, SSD and most other storage media. The software is perfect whether you have a Windows 10 machine or a much older version like Windows XP. After installing the utility on your desktop, make sure that the storage device is connected (if doing data recovery from an external device) and launch the program. Next, you specify the location for the subsequent scan, and initiate the scan. Once it’s done, you’ll see all the recoverable files, with an option to preview them before recovery. When you’ve made your selections, hit the Recover button and you’re all done. 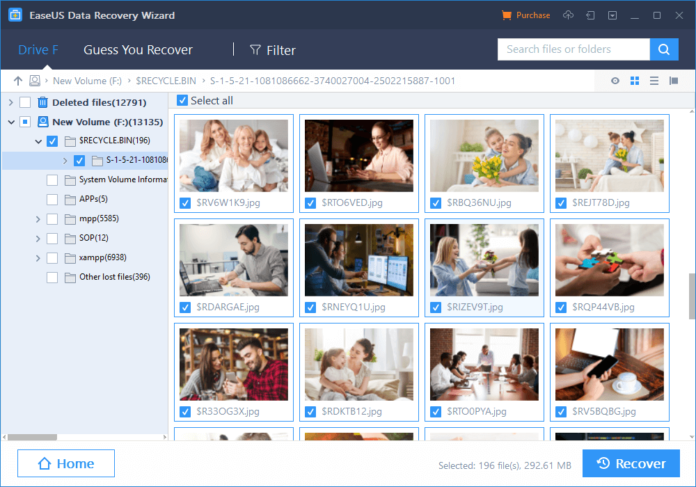 It’s so simple to use that you won’t be surprised to learn that over 72 million people have downloaded this data recovery software to date. By pushing all the heavy lifting to the back end and leaving a clean interface for users to work with, EaseUS has created the perfect mix of UI, UX, and functionality with this software. What Types of Data Can be Recovered with This Software?